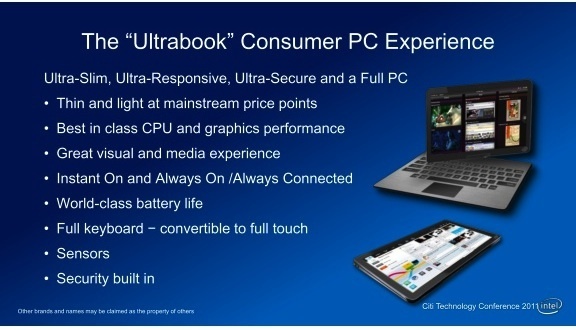 According to Intel’s Chief financial officer Stacy Smith, the Ultrabooks are going to be known as tablets in the near future. From the recent stats on the sales of notebooks vs. tablets, it’s really clear that notebooks are losing popularity as well as customers. So they are going to make some new designs of the new Ultrabook, which might be coming over the next 18 months as told by Smith at the Citi Technology Conference in New York City. This new design will include the ability to flip the screen which will be touch mode in certain situations that can be really productive in certain situations. But this platform needs some time to evolve so it cannot happen in 2011 he added. He even mentioned that this device will take a transition from a notebook to something called Ultrabook which will be very thin, light device and will provide a touch screen, a long battery life which can be kept on all the time and instantly get connected to the internet. Windows 8 was also discussed by him as he cleared the fact that Microsoft’s next Operating System will run on both Intel and ARM processors from suppliers like Qualcomm, Texas Instruments, and Nvidia. "There's going to be the Win 8 that's for PCs and Ultrabooks. That's where legacy applications are enabled. You're not going to see ARM in that segment of the marketplace," Smith said. "Then there's the Windows 8 that's targeted at tablets and devices," he added. Smith believes Intel will compete effectively with ARM in the future market as they will deliver more performance. So now we wait for them to come up with new devices and give us better options to select among a large variety.